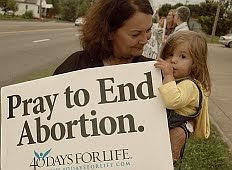 The most recent 40 Days For Life campaign ended on Sunday with pro-life groups rejoicing that at least 2000 children have been spared from abortion since the first 40 Days For Life event in 2004. The campaign did not simply involve standing outside abortion clinics, it also meant prayer. A lot of prayer. And after decades of battling for the hearts and minds of America, the effects of millions of prayers are being felt. Between faithful crisis pregnancy workers, technology that allows us to look inside the womb, and mothers who have hope for a better way, the tide is turning against abortion in the United States. There are now officially more people in America who call themselves pro-life than pro-choice, and even Democrats on Capitol Hill are concerned about pro-abortion language in the health care bill. As the latest 40-day vigil ended, an especially amazing story came out of Bryan/College Station where Abby Johnson, the director of the local Planned Parenthood, switched sides in the abortion debate. Bryan/College Station is where the first 40 Days For Life campaign was held five years ago and is the site of five more fasting and prayer vigils since. After having worked at the abortion center for eight years, Johnson's heart was moved for the unborn, and she resigned her job on October 6. "I left on good terms and simply had a change of heart on this issue. Over the past few months I had seen a change in motivation regarding the financial impact of abortions and really reached my breaking point after witnessing a particular kind of abortion on an ultrasound." "I just thought I can't do this anymore, and it was just like a flash that hit me and I thought that's it," said Johnson, according to KBTX. The fact is that abortion is losing its appeal all across the nation. A Gallup poll in May found that more than half (51 percent) of Americans polled described themselves as "pro-life" and 42 percent described themselves as "pro-choice". The self-described pro-lifers outnumbered pro-choicers for the first time since Gallup started polling on this question in 1995. Fifty-three percent of those polled said that abortion should only be legal under certain circumstances, and 23 percent should abortion should be illegal in all circumstances. Just over one fifth of those polled (22 percent) were fully "pro-abortion", wanting abortion to be legal in all circumstances. Even Hollywood is showing rare favor toward unborn babies. In a recent episode of Law and Order, the characters actually noted the shifting views in America on the subject of abortion, even arguing in favor of the pro-life position. One of the more liberal characters District Attorney, Jack McCoy, said his daughter was pro-choice until she saw her own baby on an ultrasound. The episode didn't end there. Later during a trial scene, one of the witnesses described how she had chosen not to abort her disabled child, and the jury was moved to tears. Even the pro-abortion doctor called as an expert witness was portrayed as an abortion zealot. Not only has pro-life sentiment reached Hollywood, but it has stretched even into the Democratic side of Congress! Republicans still make up the majority of pro-life advocates, but there are currently enough Democrats upset over abortion language in the health care bill to cause real trouble for Nancy Pelosi. "I will continue whipping my colleagues to oppose bringing the bill to the floor for a vote until a clean vote against public funding for abortion is allowed," Rep. Bart Stupak (D-Mich.) said Monday in a statement. Last week Stupak said he had 40 other Democrats ready to stand with him against the bill if the issue wasn't settled. The Democrat majority had supported a provision in the bill to make subsidies available for people to buy health insurance plans that would cover abortion. These developments are encouraging, and it is good to see hope for America's unborn children after decades of fighting. But the battle is not over. There are still more people who need to come to truly appreciate the value of even the youngest human life. There are millions of little ones still waiting to be born, and there are millions of mothers who will be much better off finding help so they can joyfully hold their babies in their arms. Keep praying.